For the BionicFlyingFox, our developers from the Bionic Learning Network took a close look at the flying fox and technically implemented its special flying characteristics. Due to the combination of the integrated on-board electronics with an external motion-tracking system, the ultra-lightweight flying object is able to move semi-autonomously in a defined airspace. The flying fox belongs to the order Chiroptera – the only mammals that can actively fly. A particular characteristic is their fine elastic flying membrane that stretches from the extended metacarpal and finger bones down to the foot joints. In flight, the animals control the curvature of the flying membrane with their fingers, allowing them to move aerodynamically and agilely through the air. They thereby achieve maximum uplift, even when performing slow flying manoeuvres. With a wingspan of 228 cm and a body length of 87 cm, the artificial flying fox weighs just 580 g. Like the natural flying fox, its wing kinematics are also divided into primaries and secondaries and covered with an elastic membrane, which continues from the wings down to the feet. This makes its wing area relatively large, allowing a low area loading. 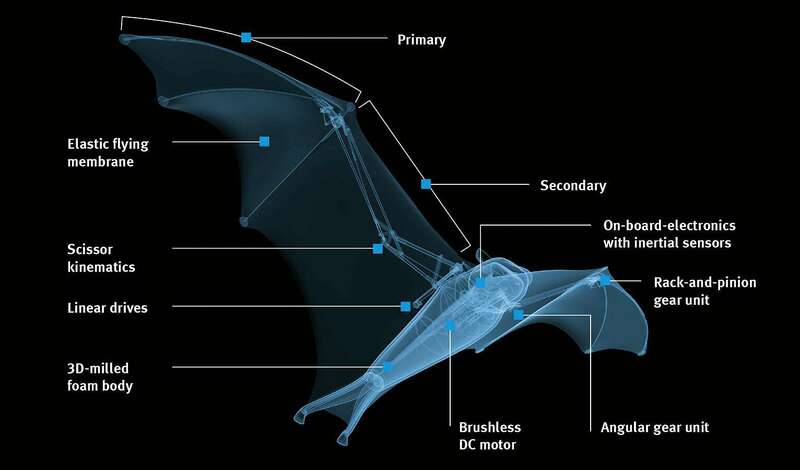 As with the biological model, all the articulation points are on one plane, meaning that the BionicFlyingFox can control and fold its wings together individually. So that the BionicFlyingFox is able to move semi-autonomously in a defined space, it communicates with a motion-tracking system. The installation constantly records its position. At the same time, the system plans the flight paths and delivers the necessary control commands for this. A person performs the start and landing manually. The autopilot takes over in flight. An important part of the motion-tracking system is two infrared cameras, which rest on a pan-tilt unit. This allows them to be rotated and tilted in such a way that they can track the entire flight of the BionicFlyingFox from the ground. The cameras detect the flying fox by means of four active infrared markers attached to the legs and wing tips. The images from the cameras go to a central master computer. It evaluates the data and coordinates the flight from outside like an air traffic controller. In addition, pre-programmed paths are stored on the computer, which specify the flight path for the BionicFlyingFox when performing its manoeuvres. The wing movements required to ideally implement the intended courses are calculated by the artificial flying fox itself with the help of its on-board electronics and complex behaviour patterns. The flying fox gets the control algorithms necessary for this from the master computer, where they are automatically learnt and constantly improved. The BionicFlyingFox is thus able to optimise its behaviour during the flights and thereby follow the specified courses more precisely with each circuit flown. In this respect, the controls are governed by the movement of the legs and hence the adjustable wing area. The BionicFlyingFox is being added to a series of flying objects which have already emerged from the Bionic Learning Network.